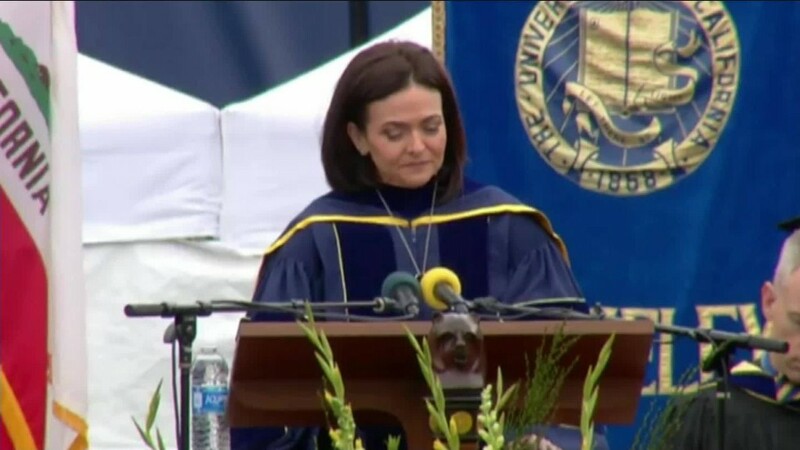 Addressing Berkeley graduates on Saturday, Facebook executive Sheryl Sandberg spoke publicly for the first time about her husband's death. She talked about the "deep fog of grief" and how she has been able to again celebrate "moments of joy." Sandberg's husband, Dave Goldberg, died in May 2015 of a cardiac arrhythmia while the two were on vacation in Mexico. Goldberg was a prominent figure in Silicon Valley and the CEO of SurveyMonkey. "His death was sudden and unexpected," Sandberg said in a prepared draft of her speech. "For many months afterward, and at many times since, I was swallowed up in the deep fog of grief—what I think of as the void—an emptiness that fills your heart, your lungs, constricts your ability to think or even to breathe." 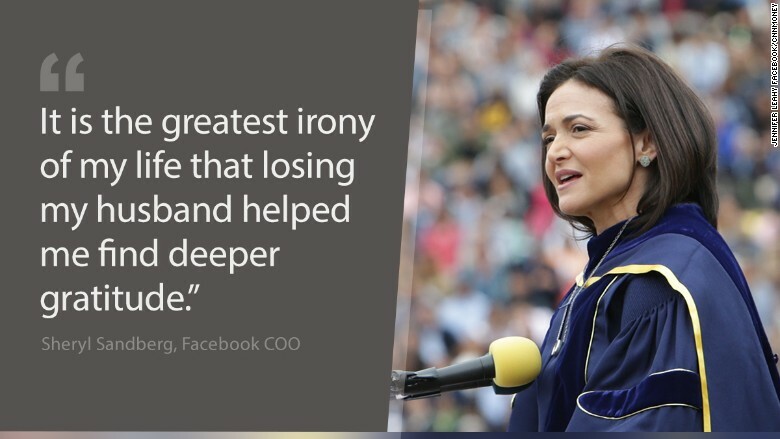 Sheryl Sandberg talked about loss, grief and learning to choose the joy and meaning in life. Sandberg said her husband's death changed her in "very profound ways" but that she learned she could "choose joy and meaning" even after loss. During her speech, Sandberg was overcome with emotion and at one point had to stop and collect herself. The audience used the pause to applaud her. "A few weeks after Dave died, I was talking to my friend Phil about a father-son activity that Dave was not here to do," Sandberg said. "We came up with a plan to fill in for Dave. I cried to him, 'But I want Dave.' Phil put his arm around me and said, 'Option A is not available. So let's just kick the s--- out of option B.'" Sandberg advised the graduating students at the University of California to not wait until they'd suffered loss to learn these lessons. "It is the greatest irony of my life that losing my husband helped me find deeper gratitude—gratitude for the kindness of my friends, the love of my family, the laughter of my children," Sandberg said. "My hope for you is that you can find that gratitude—not just on the good days, like today, but on the hard ones, when you will really need it." After becoming COO of Facebook, Sandberg published a bestselling book, Lean In, which encourages women to advance their careers. In the book, written before her husband's death, Sandberg talks about how her husband was a model of modern fatherhood and a strong advocate for her and her career. She has also said, in a Facebook post, that "the best decision I ever made was to marry Dave." Saturday's commencement address was the sixth Sandberg has given. In June 2015 -- just a month after Goldberg's death -- Sandberg used a commencement address at Tsinghua University's School of Economics and Management in Beijing to honor him. She advised graduates to "win hearts" in order to become great leaders -- something her "beloved husband" did better than anyone. She said he was a "truly inspiring leader" who "raised the level of performance of everyone around him." On Saturday, Sandberg said that a "year after the worst day" of her life, she still has a "huge reservoir of sadness" that is always with her. She held back tears as she finished her speech and urged those in attendance to "build resilience," to "celebrate each and every moment of joy" and to "kick the s--- out of option B."